WinX HD Video Converter Deluxe (ver:4.0.0) with licence key!!!!!! Have you ever wanted to convert a video to play on your phone or tablet? Need to convert from one video format to another? 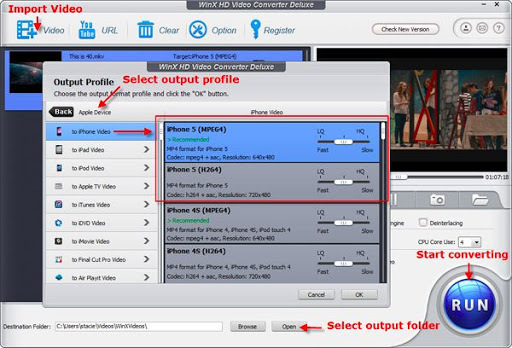 HD Video Converter Deluxe can do all of that for you. Not sure that you want to download it yet? Here are all the features, copied straight from Digiarty’s documentation. 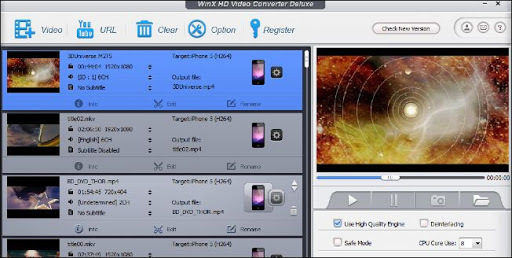 WinX HD Video Converter Deluxe, all-in-one video software as a HD video converter, video editor and YouTube online video downloader, can give you ultimate control over video files. With over 320 video codecs and 50 audio codecs, this video software enables you to convert between all mainstream video formats, like 1080p multi-track high definition videos MKV, M2TS, MTS, AVCHD, MOD, HD camcorder videos, Blu-ray videos, and standard definition videos AVI, MPEG, MP4, WMV, MOV, VOB, FLV, RM, RMVB, WebM, Google TV, etc. Moreover, it has 280+ built-in preset profiles to convert videos for iPhone (iPhone 5 included), iPad (iPad 4/iPad Mini included), iPod, HTC One, HTC Desire, Samsung Galaxy S4, Galaxy Note, Galaxy Tab, WP8, PSP, etc on the way or on the fly. Any video formats (totally 320) can be taken in as input, even incl. M2TS (Blu-ray video), MTS (recorded video), TS, AVCHD, MOD, TOD, 1080P and multi-track HD videos. Its powerful compatibility empowers you to flawlessly and easily compress/convert MKV to AVI/WMV, MTS/M2TS to AVI/MPEG, AVCHD/WTV to MP4 and more at one go. Most people have the thoughts of playing videos in the journey, but no mobile phone can play all HD videos like M2TS and MKV. With this video converter, you can make any videos compatible with your console/portable players to enjoy them on iPhone 5/4S, iPad 4/Mini, iPod touch 5, Surface, WP8, Android tabs, phones, etc. It has vivid video edit features for you to make video clips and cut black edges by trimming and cropping, or even merge multiple videos to create a new one. More specially, besides enabling inner subtitle tracks, it allows you to add external AAS/SRT subtitle files downloaded from the internet to videos. This video software enables you to download videos and MV from YouTube, Metacafe, Dailymotion, etc, and convert them to AVI, MPEG, WMV, MOV, 3GP, etc for offline playback, further editing or DVD creation. With advanced YouTube Video Download Engine, it just needs 30 sec to complete downloading a music video from YouTube. The embedded High Quality Engine and “Yadif Double Frames” De-interlacing Engine can optimize image quality dynamically, reduce noise and adjust definition to make the output video clearer. On top of that, all bitrate and resolution parameters are adjustable to balance the video quality and the file size. The feature to support multi-core CPU of this solid HD video converter allows you to take full advantage of up to 8 Cores to maximally increase the processing speed. The improved configuring for i5 i7 CPU, the optimized AMD 3DNow! and Intel SSE3 SSE2 MMX Instructions deliver a 32x faster real time converting speed.